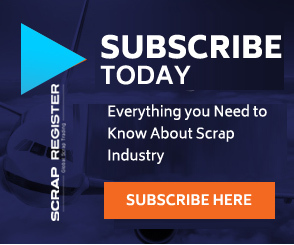 MUMBAI (Scrap Register): India’s major brass and copper scrap commodities prices dropped on the Scrap Register Price Index as on Thursday, tracking the weakness in Copper Futures prices at India’s Multi Commodity Exchange as the dollar extended its recovery after U.S. midterm elections and data showed copper imports by top buyer China fell in October. India's major brass and copper scrap commodities prices including Brass accessories, Brass huny Scrap, Brass utensil scrap, ACR copper coil 3/8 ,cc rod lme ++, copper armature, copper cable scrap, copper heavy scrap, copper mixed scrap, copper pat, copper shell 40mm, copper super d.rod, copper wire scrap and electrolytic copper strip 25mm dropped on the Scrap Register Price Index as on Thursday. The most active November copper contract on India's Multi Commodity Exchange has declined by 0.79 percent to Rs. 439.05 per kilogram on Thursday from previous close of Rs. 442.55 per kilogram. Copper Futures at MCX touched an intra-day high of Rs. 440.50 per kilogram and an intra-day low of Rs. 433.65 per kilogram during Thursday. China consumes nearly half the world's copper and data showed its imports of the metal in October fell 19 percent from September. Still, analysts were not too downbeat about copper's prospects.